As Rama's army crossed the bridge to Lanka, He made his last effort to prevent the war. 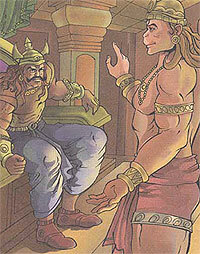 He sent Angada as his messenger to Ravana to convey the message of friendship. Kindly return our beloved Sita and make peace with the noble Rama." The arrogant Ravana replied, "I will die before making peace with my enemy." Angada answered, "This was your last chance to save yourself, but you chose not to. Now, the mighty Rama will destroy you and your entire kingdom." Ravana seethed with anger as Angada spoke these words. He ordered the rakshasis quickly seized him and were about to drag him away, when Angada, with great force, jumped to the ceiling and escaped.